Jim Harrison was running late for an event in Burlington last Thursday. But as president and chief lobbyist for the Vermont Retail & Grocers Association, he knew an opportunity when he saw one, so he sat back down in Montpelier's Statehouse cafeteria to buttonhole Rep. Kate Webb (D-Shelburne). When a new law takes effect July 1 that mandates the labeling of foods made with genetically modified organisms, Harrison argued, store owners will need more time to sell existing, unlabeled goods. Webb, one of the lead sponsors of the first-in-the-nation law, appeared wary. "Are there ulterior motives?" she asked. Food manufacturers, after all, still have a lawsuit pending against the state, in an attempt to kill the law. Harrison assured her there weren't — that he's been advising his members to accept the new law. They just want this small change. Whether Harrison wins the 18-month extension he seeks, the 12-month extension the Senate has approved or none at all remains in question as lawmakers wrap up the 2016 legislative session this week. After 29 years lobbying for Vermont's grocers, Harrison takes nothing for granted. Having won and lost many such legislative battles, he knows that anything can change before the gavel falls for the final time. The Statehouse may be run by 180 elected legislators, but equally important are the lobbyists — 440 of them are registered with the state — who haunt its committee rooms looking to shape laws for their clients. 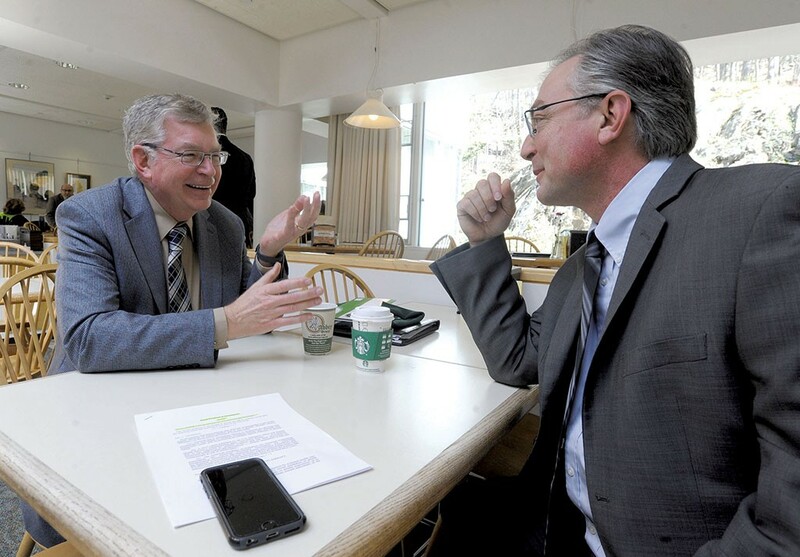 Harrison, who is retiring at the end of the year, has worked the Statehouse halls through five governors' administrations, watched the issues grow more complicated by the year and witnessed Vermont's politics inch to the left. Through it all, the 63-year-old showed that the best way to win the hearts and heads of lawmakers is through their hometowns — and stomachs. The term "lobbyist" conjures the image of a slick corporate lawyer in sleek suit, wining and dining lawmakers. More often, they resemble Harrison — an affable guy with a gee-whiz grin. Dressed in a checked sports coat and wide tie, he could easily have won the part as Richie Cunningham's 1950s-era dad on "Happy Days." While Howard Cunningham ran a hardware store, Harrison used to manage a grocery store. His first job as a teenager was bagging groceries at the local Iandoli's Market in Westborough, Mass. "It got into my blood," he said. Harrison studied business at Nichols College and then transferred to Cornell University to study food marketing. "That's when I said, 'I want to be in this business,'" he said. Harrison landed a position in Hannaford Brothers' training program and went on to manage its stores in Rutland and South Burlington. After a stint in Boston, he returned in 1987 to head the Vermont Grocers Association, which merged with the Vermont Retail Association in 2013. These days, Harrison commutes an hour and a half each way to Montpelier from his home in Rutland County, where he and his wife, Pat, raised two children. When Harrison took the association job, he knew a lot about groceries. "I didn't know anything about legislation and lobbying," he said. As it turns out, knowing groceries helped. One year, he helped kill a proposed snack tax with a technique that's become his calling card: He took a bag of goodies to a House Ways and Means Committee hearing. "I said, 'Are these peanuts taxable? And what about these over here? They're natural?' They didn't know," he recalled. "I've done that a number of times." "It is delightful for him to bring in a bag of groceries and say, 'This is candy, and this is not," said Rep. Jim Masland (D-Thetford), a member of the House Ways and Means Committee, who said he was swayed by the snack-tax presentation. "He's very effective in making his case." The goodies he leaves behind don't hurt, either. When mere groceries don't work, Harrison has another, even more powerful weapon: the grocers themselves. He remembers almost every detail of his first great success deploying store owners to tell their stories. It earned him the nickname "the Hammer." Harrison was still relatively new to the job when he asked legislators to exempt small stores from having to post prices on a per-pound or per-gallon basis. To him, small meant a store that was less than 10,000 square feet. The House Agriculture Committee defined it as 4,000 square feet. "They didn't even listen to me," he recalled. Harrison was so stunned at being dismissed that he appealed to store owners to call their hometown legislators and explain what an unnecessary burden the per-unit pricing would be. In short order, lawmakers hauled the bill back into committee and agreed to exempt stores under 7,000 square feet — a law that stands today. "He got a committee that had already made up its mind to reconsider and go his way," recalled fellow Statehouse lobbyist Gerry Morris. "I said, 'Jeez, Jim, you really hammered them.'" The Hammer has called on his base of grocers many times since to influence legislators, mindful that every one of the 180 members has at least one small store back home that may serve as a hub of the community. "Our members are our most effective tool," Harrison said. "It's that interaction that is important." As a former grocer himself, Harrison knows the challenges they face so well that he doesn't call on store owners until he has to. "He always knows what's going on," said Erin Sigrist, who joined the Vermont Retail & Grocers Association in 2015 as vice president with plans to succeed Harrison after he retires. "He was born for this." "He can do the aw-shucks and connect with folks on a very emotional level, but he has all the data and detail that back it up," said KSE Partners lobbyist Todd Bailey. "He knows the facts," said Rep. Adam Greshin (I-Warren), a member of the Ways and Means Committee, with which Harrison often finds himself fighting over soda, candy and health care taxes. "Many people sit before the committee and are vague. He has a way of imparting knowledge without patronizing us." Nearly every year, Harrison has his eye on health insurance legislation that he worries will harm small stores. The issue has only grown more complicated with time, he said. He recalled then-governor Howard Dean's foiled push in 1994 to mandate that employers provide health coverage. Harrison fought back, worried about the impact on stores that employ many part-timers. His son, then working as an eighth-grade legislative page, overheard Harrison being called "despicable" in the governor's office. Harrison took pride in the insult, but he wonders now whether that proposal might have been better than its successors. "Some days, I look back and say, 'Maybe we should've done it then and gotten it over with," he said. Health care legislation also brought Harrison his toughest defeat. In 2006, lawmakers created Catamount Health Care and enacted a tax on employers who don't provide insurance. Again, he argued, stores that employ a lot of part-timers were unfairly burdened. "That was a tough loss," he said. Today, he noted, the assessment has increased from $365 a year to $600 per employee. "It could go higher," he warned. Harrison's biggest win, he said without hesitation, came another time when he deployed grocery store owners to tell their stories. In 2010, at his urging, lawmakers made Vermont the first state to allow stores to set a minimum amount for credit-card purchases. Within months of the Vermont law's passage, the U.S. Congress followed suit. "I like to believe we paved the way," Harrison said. The Elmore Store owner Kathy Miller was among those Harrison called to the Statehouse to explain how credit-card fees killed any profit store owners could make on small purchases. She said he had a sense of what testimony would win the day. "That was really a moment for Jim," she said. "That was a home run." Harrison landed back on the losing side in 2013, when Vermont passed its first-in-the-nation GMO labeling law. His association claimed that it did not oppose labeling but argued that a state law would put Vermont stores at a disadvantage. "We lost that. It passed," he said matter-of-factly, as if he'd come to accept his defeat. In some ways, Harrison did move on, working the last two years to help his members understand the labeling rules, which take effect this July 1. But he's also still fighting. Last month, he asked legislators for a grace period to prevent consumers from suing store owners over unlabeled products that were already on their shelves. Some foods carry a long shelf life, he noted. When the Senate rejected his request for an 18-month extension, Harrison took it hard, Sigrist said, even though he got them to make it 12 months in their version of the budget bill. "He takes everything like it's his own," she said. Despite his affable exterior, Harrison conceded that he hates to lose. The hour-and-a-half drive home to Chittenden gives him time to let go, he said. Last week, Harrison turned his efforts anew to the House, lobbying Webb on the GMO extension as eagerly as a youngster still trying to win his first legislative victory. As he and Webb talked in the Statehouse cafeteria, the Hammer hadn't yet won her over. Stores had plenty of time to get ready for the new law, she countered. "OK, we'll keep talking," he said, offering her an invitation to his organization's annual conference. Where food would be served, of course.